The catch of 153 fish in the Epilogue is a story about the resurrected Christ and the Fishers of Men. 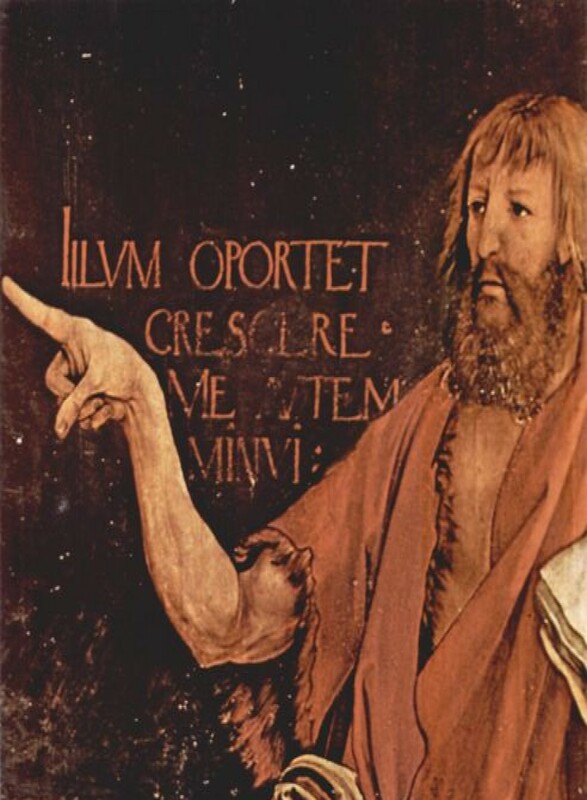 Throughout the early years of Christianity, Christ is depicted with two fish. The time of the coming of Christ was in the Age of Aries, hence he is called the Lamb of God. In 1413 we entered the Age of Pisces. Soon followed the Renaissance. Later the Reformation as materialism continued to sink deeper and deeper into science, cultural, and religion. By the year 1900, many Christians saw Jesus as just a remarkable man, or maybe even a myth. The nets of the Fishers of Men were empty. But why 153? Many have attempted to solve this because the writer of John did not waste words. Such details indicate deeper mysteries to be sought. Before we get into this, let me first describe a mathematical operative called the Power of. Its symbol is a triangle with a number written inside. So the Power of 10 is 1+2+3+…+9+10. There is a formula one can use to quickly calculate the result: n* (n+1)/2. For the Power of 10 = 10*11/2 = 55. Many before me have found that 153 is the Power of 17. Early church father Augustine described the significance of 153 as the sum of 1+2+3+4+…..+16+17. That then leads to the question what is the significance of 17? Augustine says 17 means 10 + 7 and represents the ten commandments plus the seven spirits of God, that is the solar system to Saturn. Gregory the Great agreed with Augustine’s 17 but he comes to 153 by multiplying 17 by the number of heavenly hierarchies, 9. I see the significance of 17 as the combination of the number of heaven, 7, and the number of earth, 10. Now we can better understand Christ’s words in the Epilogue “unto me is given all authority in heaven and earth.” [We’ll discuss this word “authority” in a later blog]. 17 also equals 12 + 5. This would represent the zodiac, the fullness of the Cosmic Archetype of Man plus the fullness of the Earthly Man. In this formulation, the number 153 represents every possible people group in the world and each fish represents one power of the archetype-pairing to people the world. This Wikipedia entry has several more mathematical attributes to 153. Why does the author of John say “the net was not torn”? 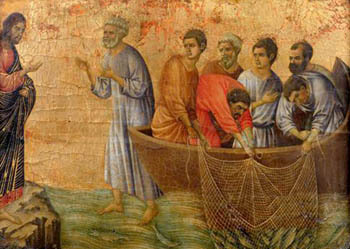 Earlier, when Peter and Andrew were called we read, “Follow me, and I will make you fishers of me. Immediately they left their nets and followed him.” In Luke 5:2-6 we read, “And he saw two boats by the lake; but the fisherman had gone out of them and were washing their nets. Getting into one of the boats, which was Simon’s, he asked him to put out a little from the land. And he sat down and taught the people from the boat. And when he had ceased speaking, he said to Simon, ‘Put out into the deep and let down your nets for a catch.’ And Simon answered, ‘Master, we toiled all night and took nothing! But at your word I will let down the nets.’ And when they had down this, they enclosed a great shoal of fish; and as their nets were breaking, they beckoned to their partners in the other boat to come and help them.” At the calling, the nets of the Fishers of Men break. Here in the epilogue of John, these nets no longer break. In summary, the Epilogue to John’s gospel is a scene where the Resurrected Christ stands on the shore of a lake. This scene recapitulates the scene in Luke where Jesus Christ calls the fishermen Andrew and Peter. In Luke, they fish all night but catch nothing. Christ advises them where to cast their nets and in so doing the catch is so great the nets break. When he says “follow me” they immediately do so. Here in John’s Epilogue, Christ again is on the shore of a lake and again they were fishing unsuccessfully in the night (dark). When he advises where to cast their net, again the nets are full but this time they do not break. It is said they contained 153 fish. Only after this do they all recognize the Resurrected Christ and only through the elevated vision of John. On the Dead Sea Scrolls Enoch solar calendar Christmas Day is on the 7th day of the 10th month. The average human gestation period is 277 days. 277 days from a conception on Christmas Day, brings you to the birth of Christ on The Day of Atonement – day 10 of month 7 ! They knew there was Something Special about Christmas Day ! When using this Temple Sadducee 19th Abib omer, amazing numerical patterns show up between the Feast of Weeks 49 day count and their corresponding day dates ! Aside from that, amongst many other interesting features on this calendar: if you count starting from Christmas Day, 153 days forwards falls on the Temple Sadducee Day of Pentecost ! ! !